At the conclusion of the two year program, students are given the opportunity to audition for the prestigious Third Year Professional Program. This cutting-edge training, designed to bridge the gap between the classroom and the profession, offers unrivalled performance experience to a select group of students. Class size is small and places in our courses are limited – please apply early to avoid disappointment. Application form can be obtained through our office. The Higher Certificate in Acting for Film (1st Year) concentrates on building a solid foundation in the craft of acting through exercises, mastering technique, theory and performance practice. The year culminates in a film shoot showcased at Graduation. Students are introduced to basic acting exercises and techniques to build a solid acting foundation. Using the body as an instrument, including vocal and relaxation techniques. Improvisation as a vehicle for harnessing the power of the imagination, being spontaneous and collaborating with fellow actors. The basics of acting technique, including finding motivation and uncovering subtext. The student is required to prepare and perform a monologue for live performance. Students will further develop the techniques learnt in the first module to deepen their understanding of textual analysis, acting and performance. The student is required to prepare and perform a scene for live performance. This module will provide students with an in depth look at the techniques required to prepare and cast successfully for all types of commercials. This intensive module explores and develops the fundamentals of the MEISNER Technique, while systematically introducing more advanced elements. Students prepare and perform a scene for live performance. The Acting for Film module introduces the skills needed to act in front of a camera for film and television. In this module, the student is required to prepare and perform a scene from a well known film, in a simulated movie set environment. In this module students learn how to access their emotions and incorporate them into their acting process. Various techniques to aid students in connecting with their emotions, enabling them to portray the varying emotional states necessary in any given circumstance. Students prepare and perform a monologue for live performance for an audience. audition script, call backs, acting technique and the practical exploration of the casting process. Module culminates in a ‘Mock Audition’. This module endeavors to help students find a neutral and well rounded accent that may be accepted as being that of an educated and well-spoken English person. The module will culminate in a recording of an appropriate English text. This module endeavors to help students find a “standard” American sound that will serve for the Coast-to-Coast US market. The module will culminate in a recording of an appropriate American text. Students incorporate methods learnt to prepare and perform 2 contrasting characters for live performance. In this module we hone fundamental skills learnt in MEISNER I and begin to explore advanced elements of the MEISNER Technique in detail. The Acting for Film – Production I module concentrates on applying and integrating theory, tools, techniques and skills learnt, to a practical film set experience. Students work towards the filming of a short scene, to be edited and screened at Graduation. The completed scenes may also provide material for the acting student’s show-reel. This module will provide students with an introduction to voice production as well as cover what is required to orally interpret and perform a choral poem in groups. Devising and Performing a Choral Verse. Students will be required to perform two choral verse poems. In this module, students begin to explore and develop the art of performing ‘short-form’ improvisation on stage. Understanding the ‘rules’ of improvisation. Learning the skills and techniques required to perform ‘short-form’ improvisation on stage. Exercises to develop the concepts of: agreement, active listening, confidence building and collaboration. Module will culminate in a performance on stage for an audience. This module will provide students with an introduction to various styles of Movement in Performance. Expression through the body as the focal point in performance. Exploring movement through rhythm, flow, shapes, patterns, silence and suspense, nuances both explosive and subtle. The use and exploration of central stories or themes that are developed into flowing and emotionally affecting performance narratives. Developing increasing control over limbs, core shapes, expression and gesture. This module will provide students with an introduction to various styles of presenting, both on camera and live. Voice and Speech for presenting. Physicality, body language and energy for presenting. Module culminates in a recording of a live presentation to camera. The Advanced Certificate in Acting for Film (2nd Year) consolidates and refines the acting techniques learnt in the first year whilst further broadening the skills base necessary to be successful in the industry. The Acting for Film – Style & Genre Module looks at the medium of Film and Television. Reflection and self-reflection as a means of deepening students understanding of character and emotional aesthetics. The main differences and similarities between comedy, tragedy, style and genre. Advanced technical skills required to act in front of a camera for film and television. The mechanics of style and genre. Students develop and shoot a scene as well as prepare and perform a monologue for camera. Students develop a more detailed approach to character creation, building on the tools learnt in Character Creation I. Moving towards a physical character. Accentuation and the expressive word. Energizing character and the inner life. Working with text to breathe life into character. Students incorporate methods learnt to prepare and perform a character – based monologue and scene for camera. Students move to an advanced level in their voice and speech training, through developing and applying vocal techniques to various performance projects. Students prepare and perform a poem for live performance as well as record a voice-over demo CD. In this module, students explore Method acting and the techniques developed by Lee Strasberg at the Actors Studio. Based on the research of Konstantin Stanislavsky, Method acting was made popular in the United States in the 1950’s and is still practiced today by respected actors, like Daniel Day Lewis, Christian Bale and Meryl Streep. Through theory and practice, students compare and contrast the techniques of method with that of the Meisner technique. The student is assessed on a monologue and a film scene. Students are introduced to tools & techniques that enable them to perform on stage. The body as an expressive vehicle in a theatre space. Projection and size. Students will work under the guidance of a Director in creating a production and performing it for a live audience. 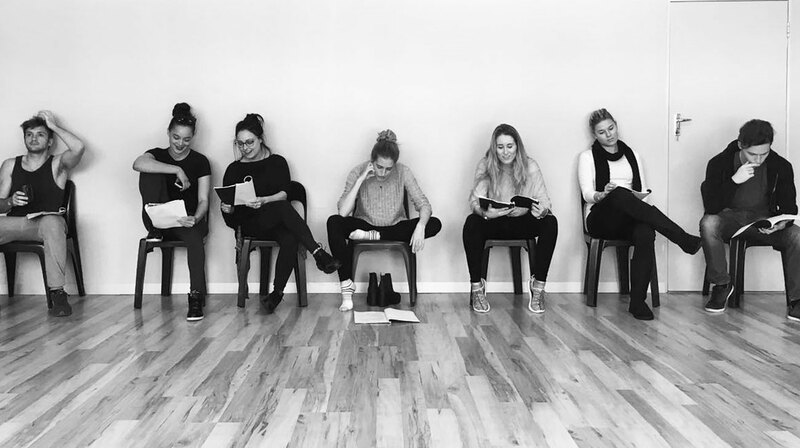 The collaborative nature of this module draws the student into the theatre production process from script development / analysis through rehearsal to final performance, providing tools for what it takes to stage a production. In this module, students explore intermediate and advanced elements of the Meisner Technique in order to integrate them into preparation and performance. While Meisner fundamentals will be further developed, there is a deeper focus on emotional triggers, intensification of states, and substitution. In the context of delivering a monologue, a high stakes imaginary circumstance is used to animate a longish piece of text with rising potent specificity. This module also starts to look at character through more differentiated emotional triggers as they can be exploited in a scene; it also looks at psychological impediment. The student is assessed on the performance of a monologue and scene. The module comprises a series of rehearsals and a film shoot, in which students prepare and shoot a 2-3 minute monologue. The module will consolidate techniques covered in the Acting for Film modules, as well as introduce advanced techniques required to deliver an engaging on screen performance. The final work will be screened at Graduation. Material may be used for the acting student’s show-reel. In this module students will script and shoot a series of 3-5min short films. The collaborative nature of this module draws the student into the film-making process from script development to final edit, providing valuable tools for how to make a short film. It is crucial for actors to not only have the capability to produce their own vehicles but to have firsthand knowledge of how to combine production with the creative process. It is for this reason all acting students will be required to serve in other crew capacities. This module will provide students with further development in voice production as well as cover what is required to orally interpret and perform a Shakespearian monologue. Module will culminate in a live performance of a Shakespearian monologue. Students move to ‘long-form’ improvisation. This is a more advanced stage of improvisation focusing on character, environment, connections, and emotions. Exercises to further develop the concepts of: agreement, active listening, confidence building and collaboration. This module will provide students with further development of the various styles of Movement in Performance. This module will further develop the various styles of presenting, both on camera and live. Module culminates in a recording of a live interview presentation.